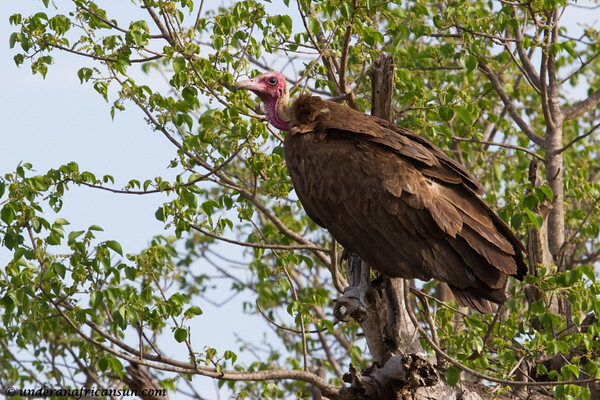 There is a tale I have been wanting to tell about my last trip to Kruger Park back in November, but first I had to sort through over 600 photos of this one sighting alone. 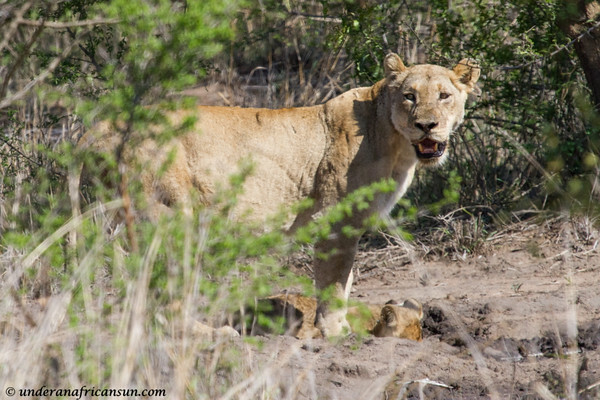 I have been very fortunate in my trips to Kruger to have had some amazing experiences, and at the tail end of this past trip, there was one more very special sighting waiting for me. Let me set the mood. It was my last full day in the park. My usual M.O. 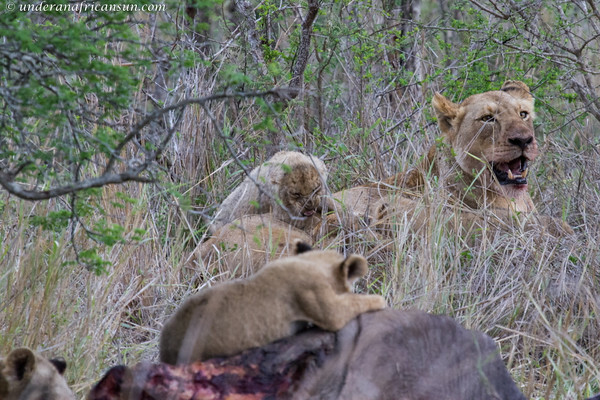 on this trip had been to get up and out around 4:30 am when the camp gates opened. This day was however, dark and rainy and I decided to go back to bed for a bit and wait out the rain. Unfortunately I soon discovered that it was also starting to rain INSIDE my hut as well. I moved my stuff out of the path of destruction and went to wait for the reception to open to get some assistance. Luckily there was an empty hut and I proceed to move all of my belongings over to my new hut for my final night. By the time I got out of camp, it was after 8:30 and finally the rain was starting to let up. 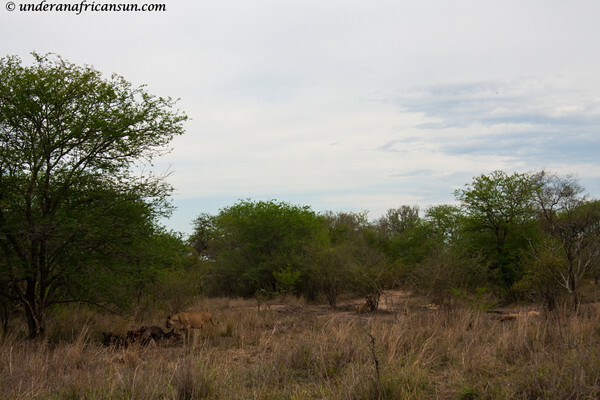 I opted for an easy drive from Lower Sabie over to Skukuza on the main road, with plans to take the gravel roads back if they started to dry up by the afternoon. Things were going according to plan. 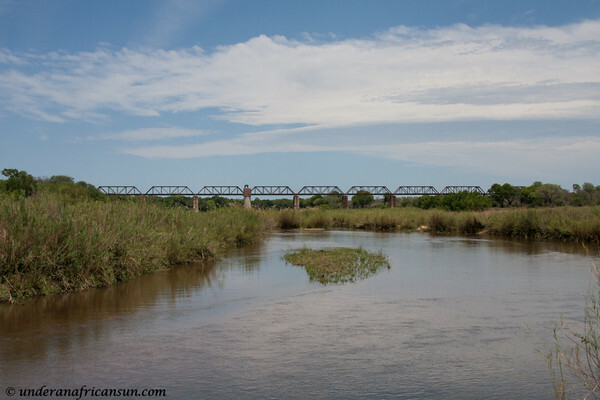 I got to Skukuza by lunch time and the temperatures were really starting to heat up after the rain had stopped. 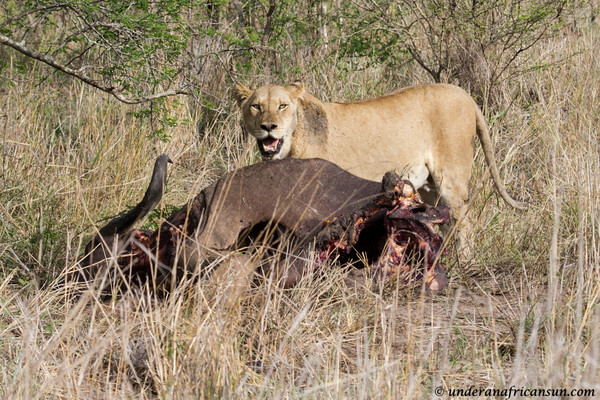 I grabbed a sandwich to eat in the car on the way back and told myself I would arrive by mid-afternoon back in camp, allowing me some time to pack up and relax. 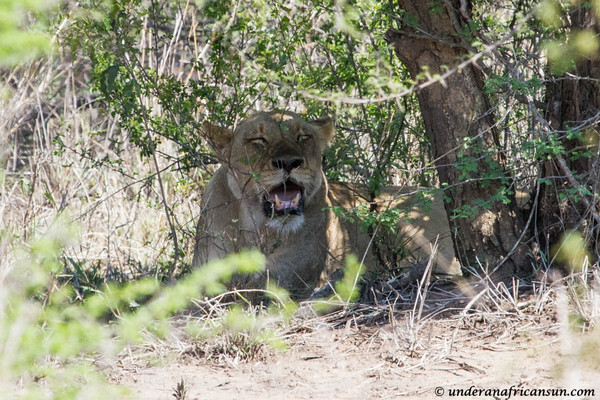 It was that period in the day when you least expect to see anything as most animals are hiding in the shade. And that is where the plan went off track. 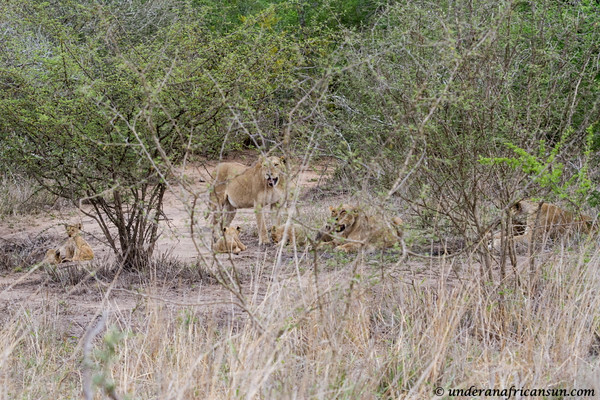 About 10 minutes into my drive back to camp, another car waved me down and asked me if I wanted to see lions. 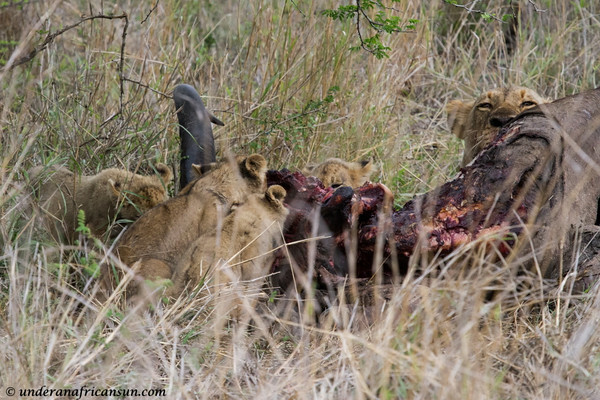 Not just lions, but a whole pride of lions with cubs on a buffalo kill, just of the road. I responded with a big yes, please, knowing my day was about to get much longer. 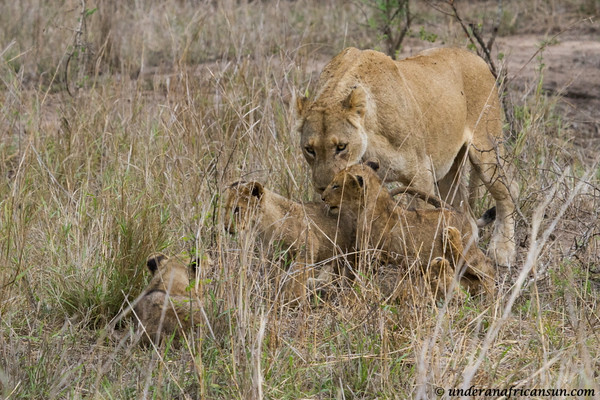 When everyone was present and accounted for, there were a total of 5 lionesses and 8 cubs (13 total tails!) scattered under various trees. 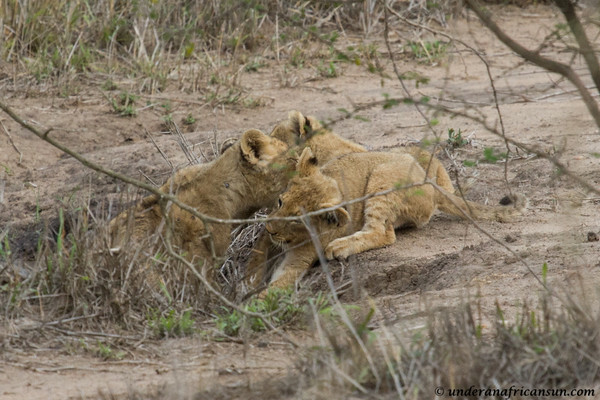 The cubs were just waking up from a nap and starting to get restless, occasionally wandering back and forth between the still sleeping lionesses. 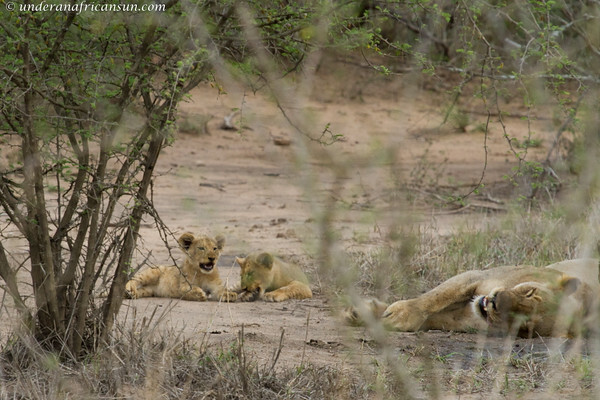 Every now and then an unseen male would roar somewhere off in the distance. 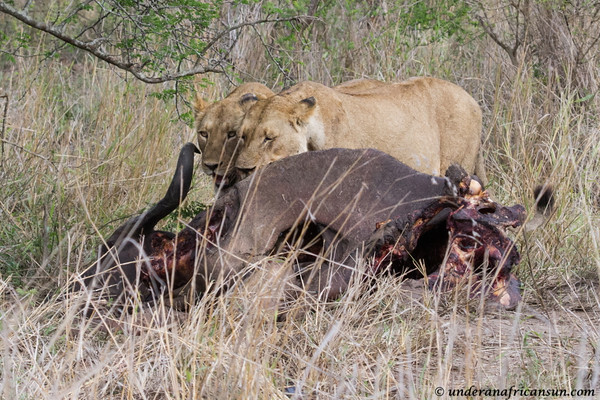 I was lucky to get a great parking spot right in from of the buffalo kill, with the hope that the lions would eventually return to continue their feast. It was now around 1:30 pm and I settled in for the long, hot wait. 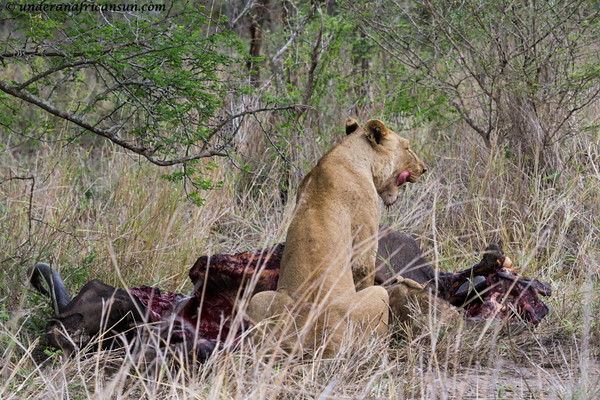 About an hour went by when finally one of the lionesses emerged from the bush to check on the kill. 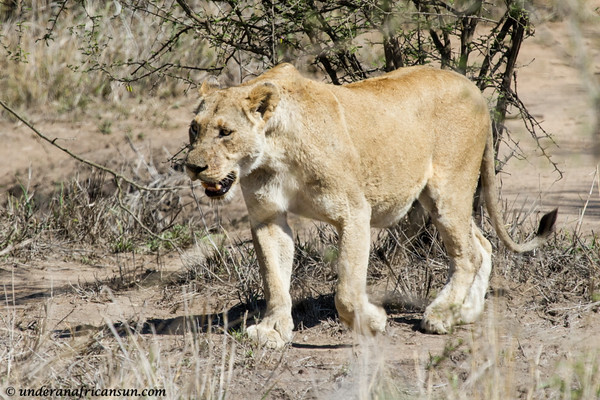 She wandered back and forth from the kill over to a water hole to get a drink. 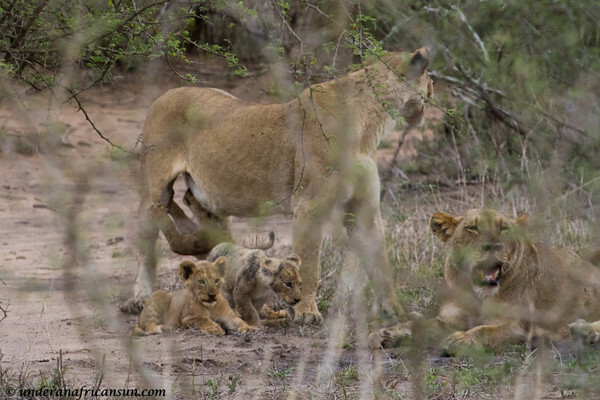 Some of the cubs soon followed, wandering around the open bush and stopping for a few sips of water with mom. 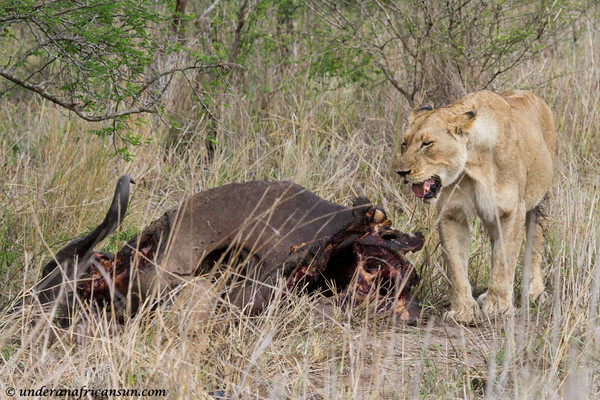 This one female must have been in charge of keeping watch as she repeated the cycle of get up, have a drink, check on the kill several times. 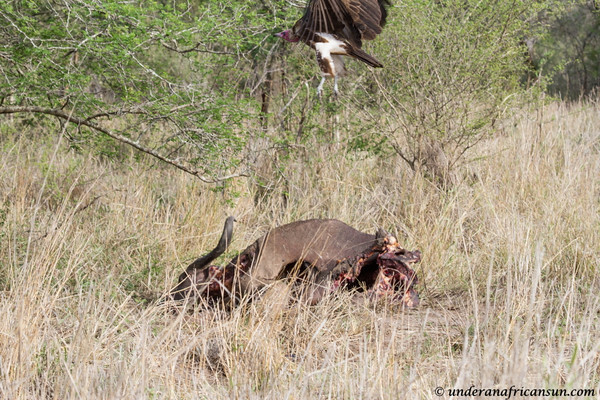 It wasn’t long before a lone vulture arrived, making a couple half-hearted attempts at the kill before being chased off by the lioness. 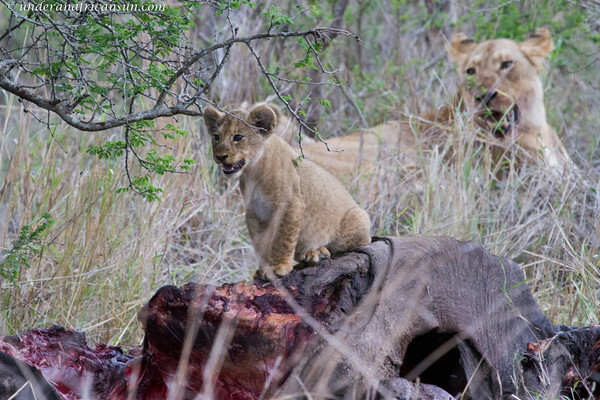 Another hour so went by when finally the rest of the pride began to stir. 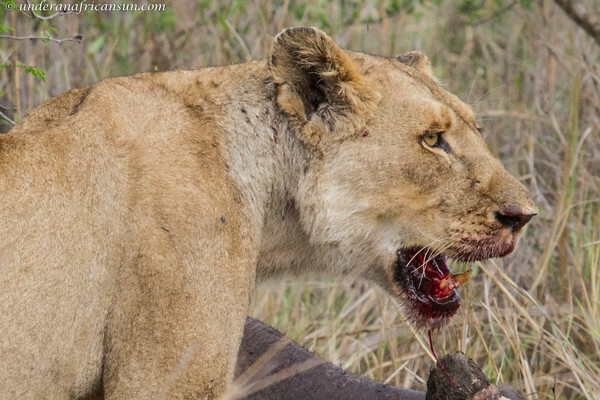 The lionesses, with their still bulging tummies, took turns going back to the kill for a few more bites. 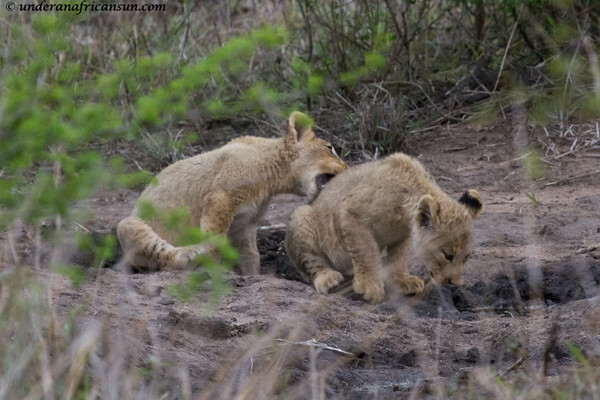 The cubs kept themselves occupied by rolling around and play biting each other, just like domestic kittens. These interactions were so special to see and such a rare treat. Mom! It’s time to get up! 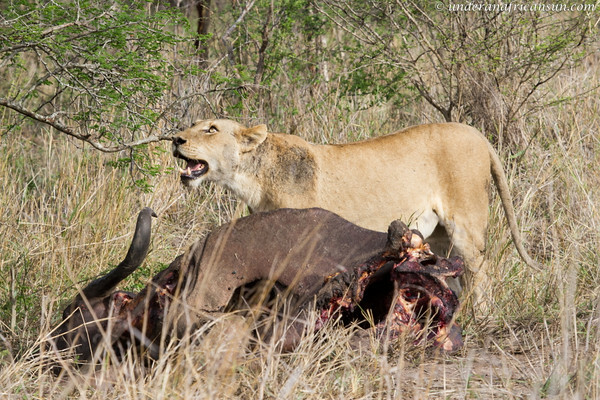 Lions like their meat rare. Very rare. 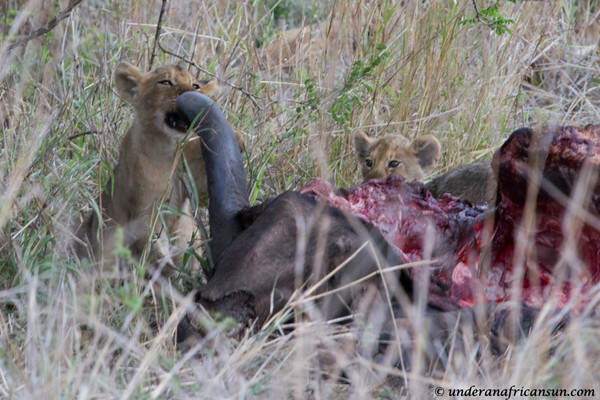 Eventually the lionesses decided it was time for the cubs’ dinner. 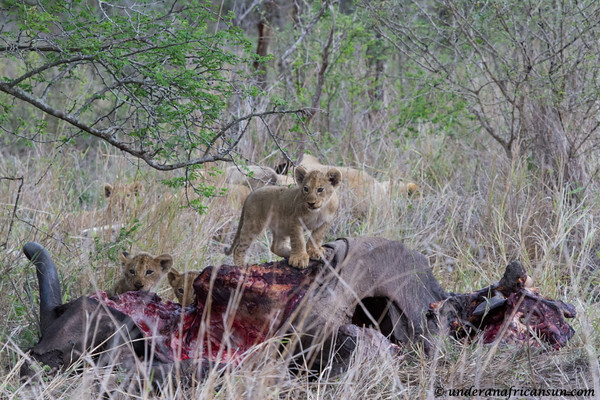 Different lionesses took turns bringing their cubs over to the buffalo carcass and the cubs wasted no time in tucking in. 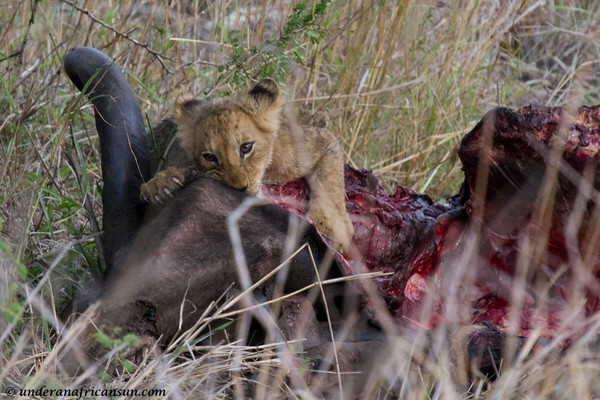 Come now, time to eat kids! 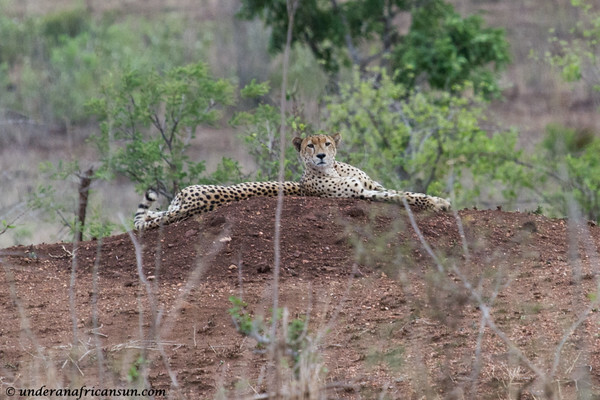 From start to finish, I was at this sighting for 4 hours. 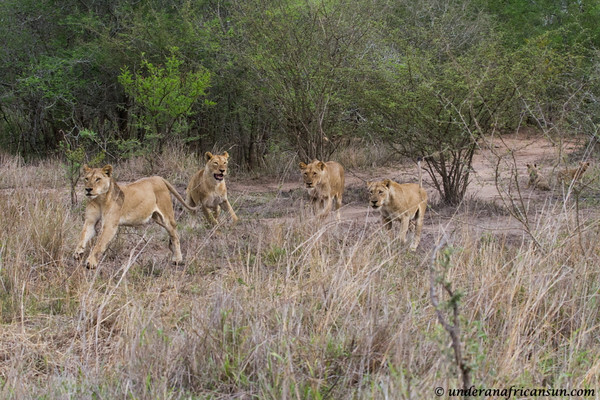 There were a few vehicles heading back to Lower Sabie so we all decided that we would drive back together to arrive before gate closing. 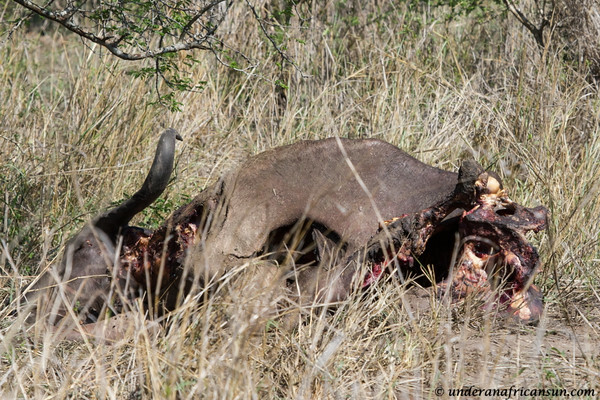 In the end, I ended up leaving a few minutes earlier as I hate being rushed to get back as many times I have been blocked by elephants or had yet another wonderful sighting on the way. This is the morning after on my way home. 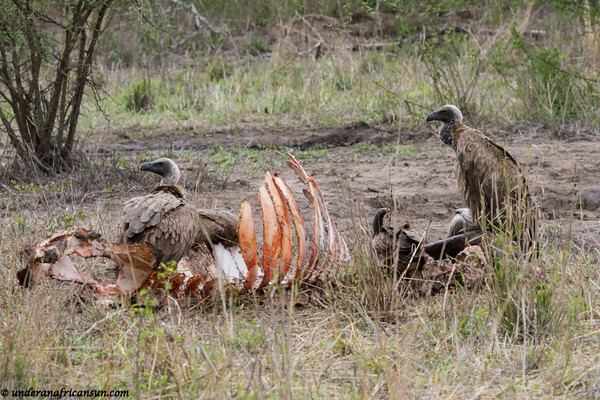 The vultures finally got their turn. Not much left, is there? 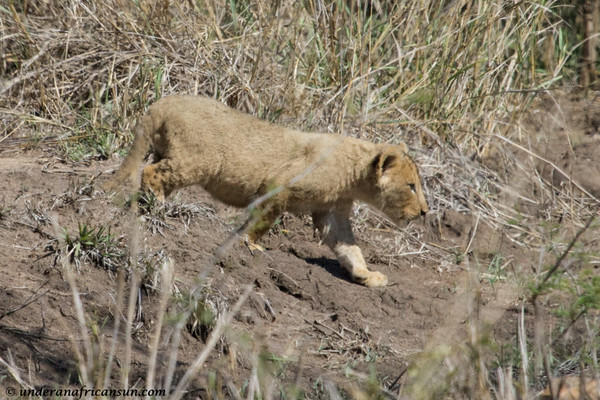 This was another rare sighting and I couldn’t believe how this day had turned out. 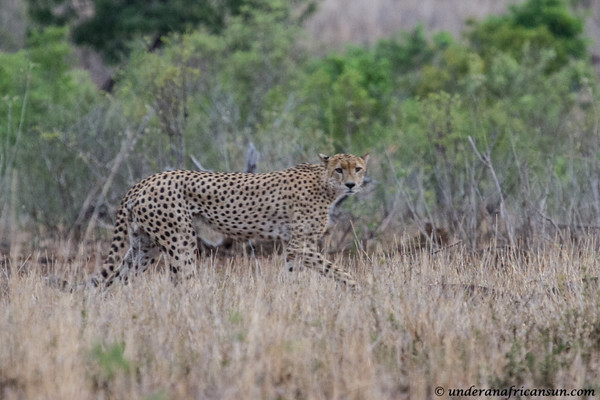 I had a few minutes to spare and they eventually got up and went for a walk-about (I have never been lucky enough to see them run, it must be amazing). 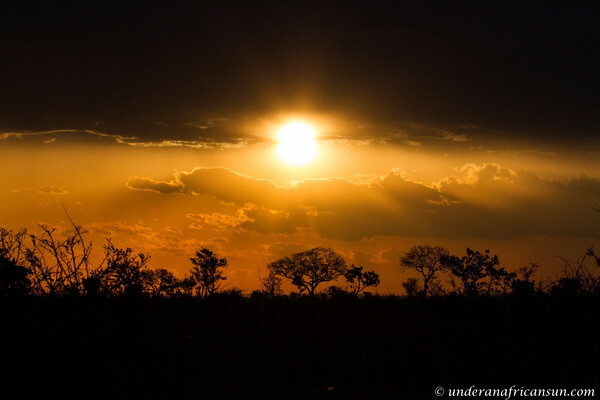 And just for the cherry on top of this extraordinary day, I was lucky to capture this stunning sunset as I made my way back to camp. 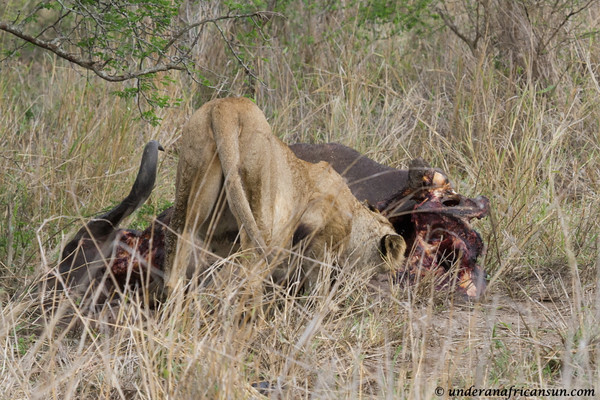 And that is my tale of 13 Kruger lion tails, I hope you enjoyed it. 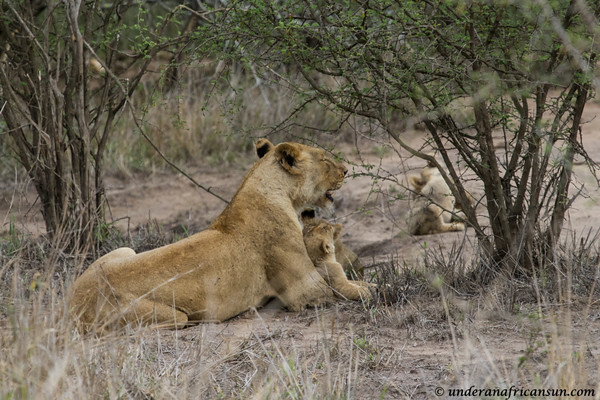 I am headed back to Kruger soon (very soon!) so hopefully I will have more special stories to share with you later this month. Stay tuned! 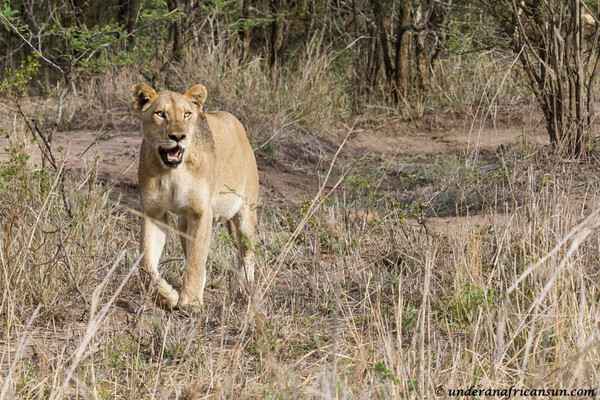 This entry was posted in Safari, South Africa, Wildlife and tagged Cats, Kruger, Nature, Reserves, Safari, South Africa, Wildlife by UnderAnAfricanSun. Bookmark the permalink. Unbelievable that you saw this, and the photos are wonderful. 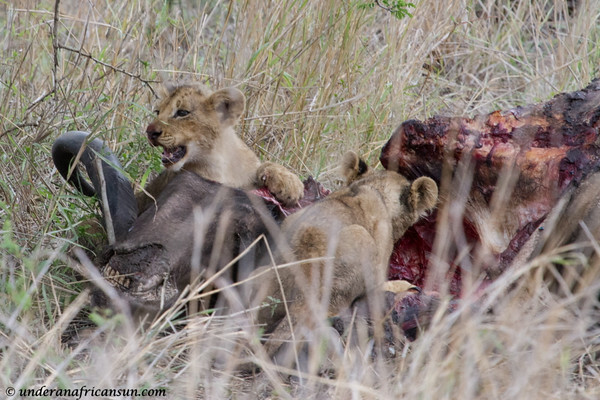 Interesting that each lioness and her cubs had a turn to eat in peace. 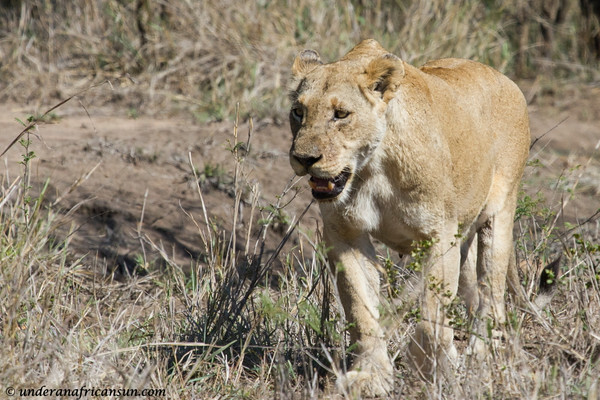 Thanks Mary, it was such a special sighting, I will never forget it. And isn’t just exactly experiences like this that makes us go back over and over and over again!? 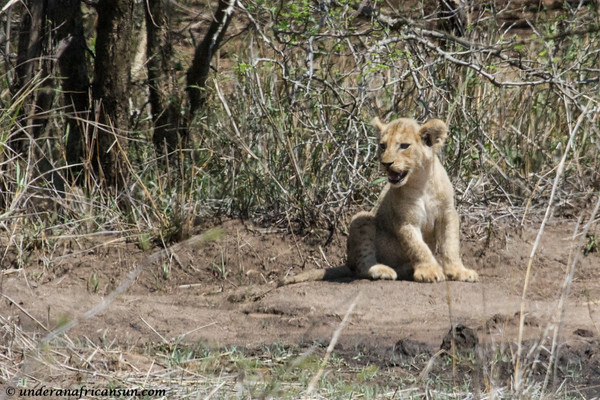 Thanks for stirring my longing for Kruger with a big spoon, Kelly! It is! Sometimes I am afraid to go back as it couldn’t possibly be as good, but it is always even better! These are the days we live for, the days that make all the slow days worth while. 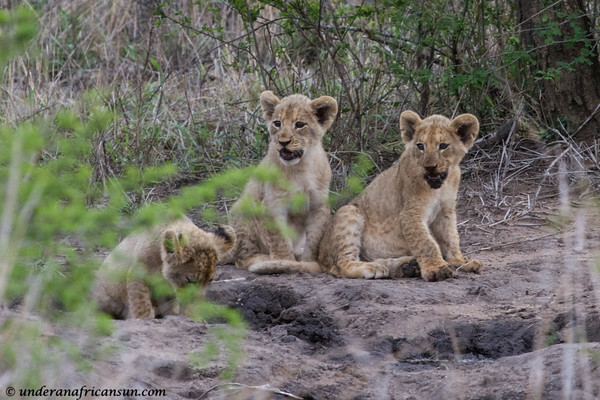 Love the little cub faces! Thanks Roxanne! I love them too!